McPherson Group policies and procedures have been designed, developed and implemented in order to secure and promote the health, safety and welfare of people at work. All McPherson personnel should be aware of the health and safety obligations required as part of working in the construction industry. McPherson Group employees are asked to provide input to the health and safety requirements of the company. As part of our compliance with the requirements of the Workplace Health and Safety Act 2011, McPherson Group has developed written procedures, safe work method statements (SWMS) and a personnel induction for all personnel and subcontractors to work under. Provision of adequate facilities for the welfare of the employees at work. Although the prime responsibility for health and safety rests with the employer, it is the responsibility of all employees and personnel to ensure their own and others’ health and safety by observing safe systems of work and reporting potential hazards in their work areas. To keep under review the measures taken to ensure the health, safety and welfare of persons at the place of work. To attempt to resolve the matter, but if unable to do so, to request an investigation by an inspector for that purpose. All personnel whilst on duty or representing McPherson Group are expected to conduct themselves in a professional manner consistent with the highest community standards. The company has a commitment to client service and excellence, if these standards are breached, counselling and/or disciplinary action may occur which could result in termination of employment for acts of serious misconduct. Treating fellow employees and colleagues with respect, and working as a team to achieve the best possible outcome for all groups involved. McPherson Group intends to operate our business in a manner which ensures the safety and well-being of all workers, clients and visitors. To do this, we need the assistance and input of those personnel who are working on our job sites and observing potential areas of hazard or incident. Early notification, discussion and rectification of a hazard will eliminate most incidents. An incident is an event or series of events that result in harm to people, damage to equipment, property or the environment, or result in a loss of work time or processes. The occurrence of an incident on any job site, requires that an Incident Notification form is completed. Please see your McPherson Group Site Supervisor or ask McPherson Group office administration to provide a copy. Fatigue, anxiety and stress are considerations when analysing a person’s fitness for work. Whether these issues are caused by work itself or from personal aspects of the employee’s life, a person suffering from fatigue, anxiety or stress can be dangerous on a job site. Tiredness and lack of concentration on the job, increases the chance of an accident occurring or a hazard not being addressed properly. Due to client deadlines, the work load and workplace dynamics, stress can be a significant issue in the daily work environment. Everyone responds different to stress. Excess stress can result in lower team morale, increased absenteeism, decreased productivity and increased accident rates. Therefore dealing with stress and reducing stress is very important for a workplace. The most effective way of dealing with occupational stress is through open, honest communication with fellow employees and management. As part of our policies to minimise stress and fatigue, McPherson Group encourage that regular toolbox meetings are conducted as an opportunity for discussion with fellow workers onsite. McPherson Group management are always available to discuss matters that you may want to keep private or that you feel aren’t being addressed sufficiently onsite.There is also time allocated for a 15 minute “smoko” break in the mornings, and a recommended 30 minute lunch break later in the day. All workers have an obligation to report medical conditions and/or medications which may affect their ability to conduct activities in a safe manner. McPherson Group maintain a zero tolerance to drugs and alcohol in the workplace. Its important to note that we will conduct Drug & Alcohol testing onsite if we feel that there is a need. There may also be Drug & Alcohol testing required after any serious incident. Excessive consumption of alcohol immediately before or during work hours will not be tolerated. Any person believed to be under the influence of alcohol or recreational drugs during work hours will be immediately removed from site and may have their employment/contract terminated. This policy applies to all workers, subcontractors or persons attending site on behalf of McPherson Group. Working outside in the sun, especially during summer, can be very hot and dangerous if personnel do not take adequate measures to protect themselves from the sun. Heat exhaustion and Heat Stroke are very real and dangerous issues for personnel who are required to work outside all day. Symptoms may include fatigue, dizziness, nausea, headaches and eventual collapse as the blood thickens and kidneys shut down. McPherson Group provide workers with long sleeve shirts, hats, tinted safety glasses and shaded hard hats. Suncream can be found in most site offices or supervisors will carry suncream in their vehicles. When weather is very warm, it is essential that regular drink breaks are taken. Personnel should be drinking around 2 litres of WATER each day to rehydrate their bodies properly. Sugary drinks and energy drinks do not sufficiently rehydrate your body. Where possible, a break from standing in the sun by utilising any shady area for smoko or lunch breaks, will assist your body to cool down to safe temperatures. McPherson Group undertakes to provide a smoke-free workplace for all of its employees. All employees and subcontractors are expected to abide by smoke free guidelines that are relevant to the workplace or job site that they are attending. Special consideration should be made on job sites due to harmful or explosive gases and substances that could be present. Work sites will generally have a designated smoking area and smoke breaks will be taken at the discretion of your McPherson Group supervisor. Please also be mindful of the environment when disposing of your cigarette. Cigarette butts should NEVER be thrown out of the plant or vehicle that you are driving. Always dispose of cigarette butts in a suitable waste receptacle. Environmental care is a very important consideration for the McPherson Group. Our environment can be seriously damaged by earthworks that are not completed in a safe and conscientious manner. Erosion and sediment – are the sediment fences and stockpiles effectively controlling any run-off into local waterways? Hazardous substances, chemicals and spillages – are there any spills or leaks from onsite plant/machinery? Waste Disposal – is there rubbish being left onsite? Flora and Fauna – are we unnecessarily damaging flora or affecting fauna? Fire Ants – have we conducted regular checks of the site and surrounding areas? Noise and Vibration – is there excessive and repetitive noise onsite that can be minimised? Dust and Air Quality – are current dust suppression methods working effectively? Contaminated soils – have any contaminants like asbestos been spotted in the ground being excavated? The presence of fire ants within South East Qld is serious and could affect our outdoors lifestyle, if the pest is not effectively managed and contained. Fire Ants are only very small, but are very aggressive and leave a very painful bite. If disturbed they will swarm as a large group, and sting repeatedly, leaving the victim with large areas of red painful rash. A fire ant nest is not extremely obvious, as it presents just like a small mound of dirt. It is important for all McPherson Group employees and subcontractors to be aware of fire ants and their nests, particularly on new job sites and any areas that is listed on the Queensland Government’s Fire Ant Biosecurity map as being within Zone 1 or Zone 2. At McPherson Group we are committed to reducing the potential for manual handling types of injuries. Staff are encouraged to to identify hazards and associated risks. Risk assessments need to consider poor working posture, repetitive handling and the application of force. Regular rest breaks and changes to posture or repetitive movements is essential to eliminate the chance of injury or strain. First aid involves the first response treatment and stabilisation of ill or injured persons. Early treatment is crucial in recovery from injuries. Most job sites will have a trained First Aid Officer and First Aid Kit within the site office. If there is no site office, your Site Supervisor will be a trained First Aid Officer and will have a First Aid kit available in their vehicle. In the event of an injury, even a small graze, First Aid treatment is essential to avoid any bacterial infections, cross-infections or further serious injury. It is also important that you notify your Supervisor and complete an Injury Notification form so that the cause of the injury can be addressed, especially if it is a hazard that poses an ongoing threat to yourself and others onsite. Remember, if the injury is serious and requires medical assistance, call 000 immediately. Any personnel, subcontractors or visitors to a construction site MUST have their own General Construction Induction card, also known as a “White Card” or “Blue Card” issued to them by a Registered Training Organisation in Australia. Persons operating machinery or trucks are also required to hold the relevant tickets or licences that are issued for the safe operation of that specific item of plant. Safety awareness training and toolbox discussions are held regularly onsite by clients and by McPherson Group. Attendance at these training sessions and toolbox meetings is compulsory for all McPherson Group employees. McPherson Group encourages employees to participate in ongoing training and professional development where possible. Attending courses in subjects such as First Aid, Fire Ants Awareness, Asbestos Awareness and various Workplace Health and Safety certificates, is seen to be taking positive steps towards promoting the health and safety of our workplace. As defined by the Workplace Health & Safety Act, the operation of mobile plant is considered a High Risk Activity. Awareness of machinery movements onsite and a working knowledge of the operation of machinery is essential for all personnel on a construction site. Labourers and spotters working on the ground, must know the safest areas to stand when working with excavators. Labourers and spotters must maintain a clear line of sight with the machinery operator, must maintain regular communication with the machinery operator and at at all times, must be mentally conscious of the works in progress around them. 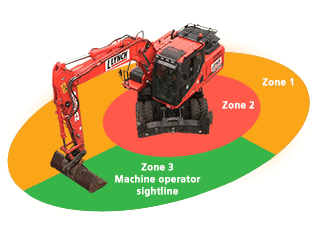 Machinery operators need to be aware of the blind spots of any piece of machinery that they operate. Mobile plant, including the boom of an excavator, should not be moved if the operator cannot see ground personnel or communicate with them. A safe working area must be maintained around the machine at all times. This includes the area being clear of personnel, equipment, tools and materials. A person cannot approach an operating machine, before successfully communicating with the operator and all machinery movement being stopped. As part of McPherson Group’s commitment to safety, we ask that all personnel and subcontractors complete the following questionnaire, to demonstrate their understanding of the above policies and a general knowledge of working with large mobile plant on construction sites. Once these questions are completed, they will be submitted to our office for evaluation. If McPherson Group Management, assess that your answers are not sufficient for safe attendance onsite, we may ask you to come into the office for further training or discussion.